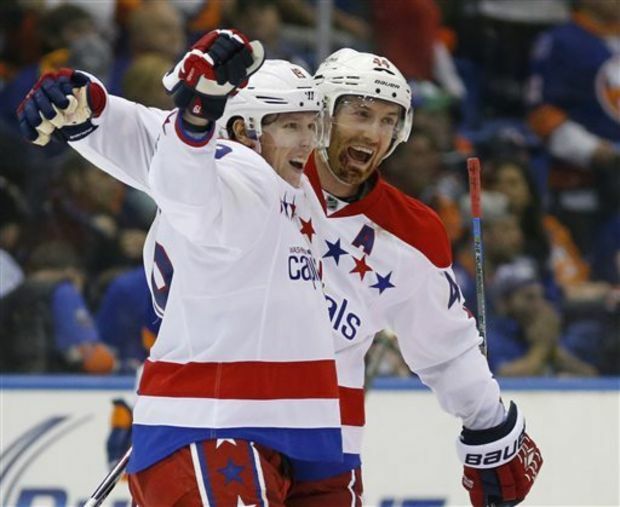 The 5th-seeded ’14-’15 Capitals started the series with a blowout win in Game 1, 6-1. They scored four goals in the first period alone, including two from Alex Ovechkin. Then, in Game 2, they needed just two goals from Nicklas Backstrom as goaltender Braden Holtby posted a 38-save shutout performance. Backstrom then scored late in the third period of Game 3 to force an overtime where Eric Fehr won it to give them a 3-0 series lead. The 4th-seeded ’85-’86 Capitals finally got on the board in the series with a 6-4 win in Game 4. Bob Carpenter netted a hat trick in the win and his hat trick goal was the game-winner with just over five minutes left in the third. Dave Christian scored at the 12:18 mark of the third period in Game 5 to give the ’85-’86 Capitals a 2-1 win and force a Game 6. Goaltender Al Jensen stopped 36 of 37 shots against to lead them in the win. Game 6 was a doozie. The ’14-’15 Capitals scored first, thanks to a PP goal from Troy Brouwer. The ’85-’86 Capitals then rattled off three straight goals in the opening period, including two from defenseman Larry Murphy, to hold a 3-1 lead going into the second. The ’14-’15 Capitals potted the next two goals to tie the game 3-3 at the 13:26 mark of the second. However, a little over a minute after that, Alan Haworth scored for the ’85-’86 Capitals to retake the lead. They would hold on and even add an insurance marker late in the third to force a Game 7. A goal late in the first and early in the second from Ovechkin had the ’14-’15 Capitals up 2-1. However, later in the second, the ’85-’86 Capitals would score three goals in a span of three minutes to turn the tides and take a 4-2 lead. Then, in the third, after a PP goal from Brouwer to make it a one-goal game, Eric Fehr scored almost two minutes later to tie the game 4-4 and eventually force overtime. OT didn’t take long as Brooks Orpik ended it just two minutes and 22 seconds in to give the ’14-’15 Capitals the series and deny the ’85-’86 Capitals a 3-0 series comeback. Up next is the 2-7 matchup between the ’89-’90 Capitals and the ’10-’11 Capitals! This entry was posted in Qualifying Tournament, Ultimate NHL Playoff and tagged Al Jensen, Alan Haworth, Alex Ovechkin, Bob Carpenter, Braden Holtby, Brooks Orpik, Dave Christian, Eric Fehr, Joel Ward, Jorgen Pettersson, Kevin Hatcher, Larry Murphy, Nicklas Backstrom, Qualifying Tournament, Scott Stevens, Troy Brouwer, Ultimate NHL Playoff, Washington Capitals. Bookmark the permalink.